Bonus Days from Stampin’ Up! Oh my gosh…I am super excited about Stampin’ Up!’s July Bonus Days that starts today! This is the first time Stampin’ Up! has offered coupons to customers! All you need to do to earn $5 coupons is spend increments of $50 in July (no limit). Stampin’ Up! will email you a coupon for every $50 you spend, and you can use coupons on anything you want in August…WooHoo! NEW Bonus Days from Stampin’ Up! For every $50 you spend* between Thursday, July 7-31, you’ll get a $5 Bonus Days coupon that you can use between August 2–31, 2016. This is a great opportunity for you to get items from your wish list or stock up on essentials (paper, adhesives, ribbon, etc). This is the first time Stampin’ Up! has offered this type of promotion, and I know you’ll want in on! IMPORTANT: Bonus Days coupon codes will be delivered via email, so a valid email address is required to participate in this promotion. They will be unable to resend emails for coupon codes, so make sure you save the email AND write down the codes in a safe place so you don’t miss out on the coupons you earn. Lost codes cannot be recovered. Bonus Days coupon codes can be redeemed for any product, excluding Starter Kits and Paper Pumpkin subscriptions. Though, new prepaid Paper Pumpkin can be redeemed. 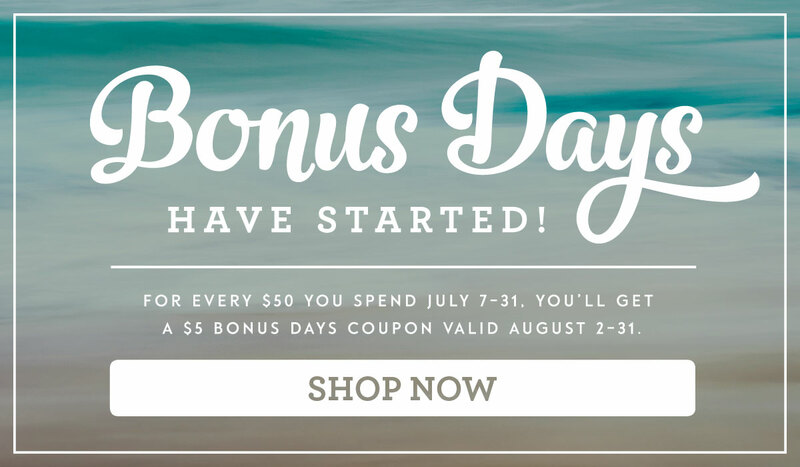 Bonus Days coupons codes are used in the checkout process during the redemption period. Print and use the backside of the flier to record your “coupon codes” and be ready to redeem them in August! Just to be on the safe side, please save your emails too! Better to be safe than sorry, right? !